There is this Japanese music video that gained high valuation by overseas viewers. It is a video for a song titled “Mushi no Tameiki (Bug’s Sigh)” sung by Handsome Kenya, an indie musician. JAPAN Style has already shared one of his music video in the post “High Quality Indie Animation Music Video by a Japanese Creator.” In the post you can see the beautiful MV directed by a Japanese professional visual/animation creator, Kousuke Sugimoto. The new MV is also created by Sugimoto, and this time, this is not full animation but live-action anime. Starting with a scene in front of an ordinary station, Handsome Kenya becomes the king in a bug world. It is an old-fashioned tune but sounds very fresh in today’s J-pop. The video is well made and match with the song. The musician, Handsome Kenya has not come out in the main stream, or appeared any TV show yet, so there is not much source to lean him better besides his official website. But Rocket News24 (link below) had an interview with Handsome Kenya recently, and reported that another interview will be in the latest issue of Rockin’ on Japan (J-rock and pop magazine). In the Rocket News 24 interview, Handsome Kenya said that he doesn’t think of himself as a handsome guy but he call himself as an antithesis against good looking guys. He respects Beatles, and he cuts his mushroom hair like Beatles. 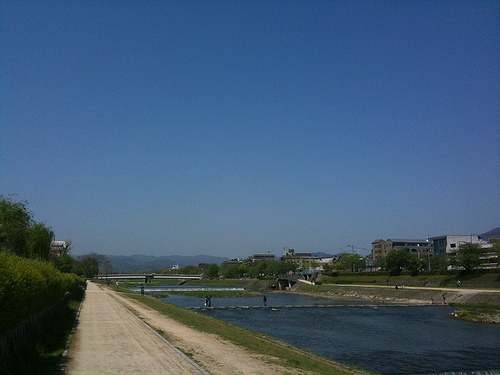 He is from Kyoto and writes songs around Kamogawa (Kamo River).